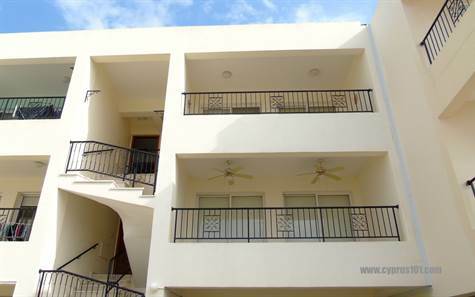 Kissonerga, Paphos – This exceptional 2 bedroom top floor apartment is situated in a quiet residential area in the traditional village of Kissonerga, within easy walking distance to local amenities and the beach. The property has stunning panoramic coastal views which can be enjoyed from the lounge patio windows and the private balcony beyond. The sunsets are breath-taking from here. The open plan living space is impressive in size and features a comfortable lounge, spacious dining area and well equipped kitchen with breakfast bar. The kitchen has plenty of fitted cupboards and worktop space. Appliances include built-in oven, electric hob, extractor fan, fridge/freezer and washing machine. A hallway to the rear leads to two large double bedrooms with fitted wardrobes and a good size modern shower room. On the ground floor to the rear of the allocated covered parking space is a large external store room which is also ideal for use as an office or workshop/hobby room. Furniture is negotiable and there are full title deeds.